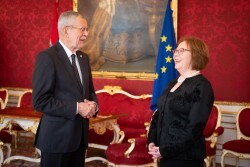 On March 19, 2019, Austrian Federal President Alexander Van der Bellen welcomed the newly accredited Ambassador of the Republic of Namibia to Austria, H.E. 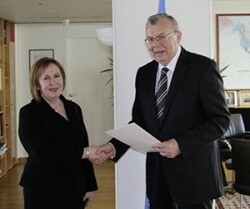 Ms. Nada Kruger, to the Presidential Chancellery of the Vienna Imperial Palace for the presentation of her letter of accreditation. This article includes a total of 45 words.